This is Part IV of our series on building an integrated marketing plan. You many want to review Part I and Part II where we discuss target audiences as well as Part III where we discuss categories of content. We’ve reached the final phase in our integrated marketing plan. In this phase, we discuss how you are going to distribute the content you’ve created through different channels. After all, content that no one consumers is wasted content. In this post, we’re going to talk about some principles of channel management, six different channels for you to consider and how to evaluate whether those channels will work for your plan. You will leave this section with a much better understanding of the right channels for your organization and a plan to justify your recommendations. Traditional channel management refers to the many ways that an organization moves its products from production to consumption. For example, Apple moves its many products to consumers directly through its own stores and its own website as well as a massive number of third-party retail and online stores. Each group of stores and websites would be considered a channel. Instead of moving products, our focus is on moving content that you produced to those places where our target audiences can consume it. This the “delivery” phase of our Target Audience > Content > Delivery model discussed in opening of this series. Your goal as the head of marketing is to understand the overall picture and direct resources (time and money) that will achieve your overall business goals. We go into much more detail about each of these in a minute. What’s important is to understand the channels where you have control and channels where you have influence. The channels on the left side of the chart — Digital, Social Media and Direct — are where you have a high level of control over the content, branding and/or design. For example, you control the content and branding of your website, which is part of the Digital channel. These channels are the best for closing sales and motivating your audience to take actions that benefit your organization. 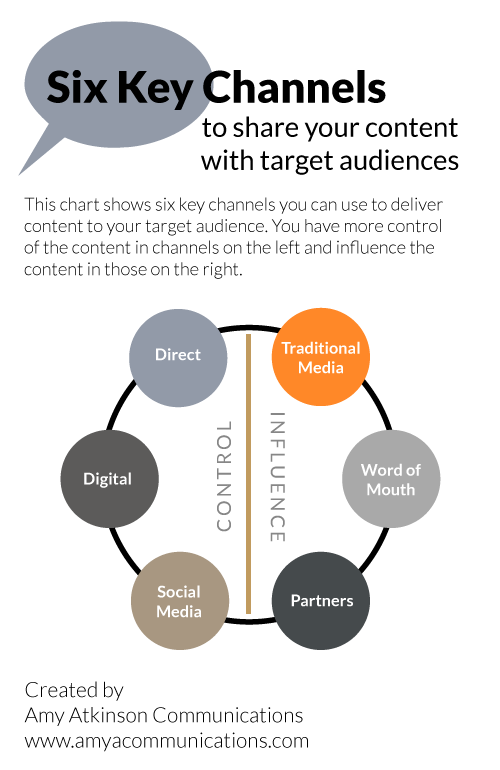 The channels on the right side — Word of Mouth, Traditional Media and Partners — are where you influence over the content but don’t have control. An example would be media coverage of your company. You can influence the direction of the story by the quality of your media relations, but the reporter and editor have ultimate control of the final product. These channels are best for overall awareness helping new people discover your company and your products. These differences are not absolutes. For examples, good SEO, which is part of the Digital channel, will help new people discover your website and thus your company. Likewise, a recommendation via word of mouth can close a sale faster than any sales sheet. The distinction is far more about where you have control and where you have influence. The other major consideration with channel management is leverage — the ability to use content across multiple channels. This is a key philosophy in Amy Atkinson Communication’s approach to integrated marketing. Leverage improves the efficiency of the your overall marketing. For example, media coverage of your company is great content for your website, blog, social media and even email. It’s one less of piece of content you have to create. Similarly, a well-written email might lead to a recommendation, or a great blog post might make it into a news story. Let’s dive into the specifics of each channel. The Digital channel includes anywhere online where you have control of the content, branding and/or design. Your company might also have a custom SaaS application or a app that helps target audiences access your products or services. We could easily make the case for email being in the Direct channel because you are sending content directly to people for whom you have an email and possibly a name. However, it’s easier to include it here because of the digital delivery. Similarly, we included PPC advertising here because of the online delivery and because the search engines aren’t often what you would characterize as Traditional Media with stories and news coverage. We’ll cover those media in the Traditional Media section. The strength of this channel is conversion because you have a tighter control of the message, the design and the flow of content. In fact, if you not focusing on conversions, you’re doing something wrong. The Digital channel lacks the visibility of other channels because you have to build the audience. The exceptions are SEO and PPC that can both help you acquire new visitors. Similarly, email can increase visibility for new products and services among the people you already know. Your website should be the hub of your marketing efforts. Whenever possible, make a place on your website for all the content you produce so that your target audiences have a central place to find everything about you. Direct marketing includes any in-person communications or those cases where your company already knows someone either by their name and/or email address. Once again you have tight control of the message and branding, such as a presentation delivered at an industry conference. This channel is excellent for brand building and lead generation. In general your audience for Direct marketing will be smaller but more highly targeted. The Social Media channel is its own special beast that combines elements of many other channels. Many people lump it under digital marketing, but we believe it deserves its own category. The second tier of networks includes dozens of niche networks depending on your target audience and where they spend their time online. The true values lie in the network effect of your audience as well as your ability to build an audience with whom you share content regularly. What makes Social Media unique is the voice it gives the individual consumer. While you do have control over the content that you post, individual consumers can share, comment, critique, engage with and, yes, troll your content. More than any other channel, Social Media requires separate channel strategies for each network. The way you share content and how potential consumer engage on each network, be it Facebook or Instagram, is unique. You many want to check our post on Social Media Programming for more insights. While it is harder to categorize these days, we consider Traditional Media any media (print, broadcast and online) that features stories written for a target audience; has reporters and editors who create those stories; and derives its income from mainly from advertising. In rare cases, Traditional Media may derive its income solely from subscriptions, e.g. Consumer Reports. Traditional Media includes your national publications, like USA Today; trade publications, like Hospitality Technology; and local media. Traditional Media’s strength is its ability to generate awareness and visibility. The audiences are both larger and more targeted than any other channel. For example, a well-placed article about your company can double your number of leads overnight. At the same time, the competition to appear in Traditional Media is much greater and highly dependent on the quality of your content. The most common strategies you’ll consider are media relations and advertising. Let’s explore each. In return for the visibility, you have to sacrifice some control of the message. The reporters and their editors will decide the direction of story and what quotes, photos and graphics, they choose to include based on value to their target audience. In addition to visibility, positive stories help your organization build credibility. The second strategy with Traditional Media is advertising. In this case, you have control of the message and placement of your content (as long as it fits the publication’s guidelines). Unlike media relations, you also have control over the frequency of placement based on your total advertising budget. The challenge with advertising is attention. You have competition for attention from the other advertisers in the publication or on the website. And you have competition for the readers’ attention and belief in the advertising message. Partners are often overlooked as a effective channel for reaching target audiences. Partners are organizations that will share your content but not necessarily a detailed list of their audience members. You may be thinking that sponsorships are really paid advertising. That is partly true. The difference is the level of partnership, whereas advertising is more transaction. As a sponsor, you can negotiate exclusivity, speaking engagement, contest, emails and other opportunities that advertising doesn’t afford. The great value of Partners is your ability to leverage their brand and the trust they have built with their audiences. The audience members are more likely to open, read and act on content from organizations they already know. When assessing potential partners, look for those that share your target audience and offer a complementary service. We include Word of Mouth because it is an important channel for driving new leads and business opportunities. Every organization should have strategies for encouraging and following up on referrals from satisfied customers. Warm leads and recommendations are often easier to close than other leads. Besides a referral strategy, Word of Mouth is difficult to plan. The Word of Mouth Marketing Association has some excellent resources. 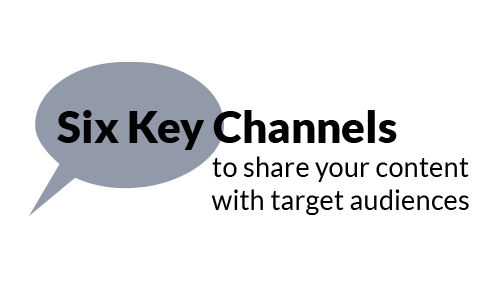 As we’ve gone through this series, we want to share thoughts on scoring and evaluating each of the channels. This part of the process will help you identify priorities and justify your recommendations to other executives. These criteria are very similar to those from Part III on Content with a few small tweaks. This criteria refers to your knowledge of the selected channel and ability to use the channel right now. You’ll have to make some judgment calls here. For example, your company website may not have a great content management system that allows you to update the website. That would impact your capability to make updates. What is our level of expertise with this channel? Do we need to hire outside contractors to help? Do we have relationships that we can leverage? Score yourself a 5 if you are ready to use the selected channel today and a 1 if you will need a lot of help from outside the organization. Your goal is to get content to the market as fast as possible. However, there are channels that take longer to get into the market. For example, using the Partner channel requires finding the right partner, deciding on a project, discussing shared goals and multiple rounds of revisions. Similarly, advertising campaigns can take months to develop. How much research and planning does this channel require? Do I need to get approvals before distributing content? If so, how long will those take? Can I make revisions to the content once it is in the market? Score the channel a 5 if you can distribute content immediately and update it frequently. Give yourself 1 if it will take a long time to distribute content or you have lots of approvals to secure. This is a top consideration for any channel. Reach evaluates how many people could potentially see your content. The circulation of a newspaper or followers on Twitter are both measures of reach. Traditional Media has a built-in audience of readers and fans. Other channels, like Social Media, require you to build the audience and relationships with influencers. But reach is also about relevancy. You want to reach the most people likely to benefit from your content. Visibility for visibility sake will stroke your ego, but it won’t improve your bottom line. How many people will potentially see my content? Does my target audience engage in this channel? Will I need to develop the audience for this channel? Again, score yourself a 5 if this channel is developed and ready to help you reach the target audience. A 1 would be a channel that you need to develop. Channels have varying levels of measurability. It’s easy to measure activities in the Digital channel, e.g. website sessions or email open rates. Conversely, it’s hard to measure Traditional Media, whether its the impact of a news article or a specific advertisement. Don’t forget you can measure both activity and outcomes. Let’s take an advertising campaign. Your activity measures would be the placement of ads. The outcomes would be the number of phone calls for ads with a specific phone number or clicks for online display advertising. Can I measure the activity? Can I measure the outcomes? Do I have to tools I need to measure the channel? Do I have the expertise to understand and interpret the data? How hard is it to create reports? Score yourself a 5 if the channel is measurable and you have the expertise to do so. Give yourself a 1 if you the channel is difficult to measure or the measurements are not clear. The final measure to consider is cost of content distribution. This would include financial obligations as well as the time needed to manage the distribution. Posting content to your website will have little overall cost, whereas an advertising placement can be millions of dollars. You may also need to hire a media buyer or outside consultant to manage the distribution. Don’t forget the startup costs associated with a channel. Creating a Pinterest account is simple, but you will have to spend hours creating boards and pinning interesting content. Likewise, you may need a designer to design your cover images for social media. Make sure to account for maintenance costs. Every channel requires some level of ongoing maintenance, whether it’s your website, PPC or media relations. Do we have any startup costs? What are the ongoing maintenance costs of this channel? Do we need to hire an outside contractor to manage this channel? The lower the cost the better. Score your channel a 5 if the costs are low and the staff time is minimal. Score a 1 for anything that is costly in terms of money or time. Channels to distribute the content to target audiences. You also have tools to score each step of the process. There are many elements of a comprehensive plan that aren’t included in this blog series, but this certainly gives you the core elements to help you begin forming a well-thought-out plan to help you reach your communications goals. We will close out this series by discussing some of the common challenges and offer a little more context about how the pieces fit together. Make sure to subscribe to our blog newsletter if you don’t want to miss that last post. The subscription form is in the top right on the page.